ISP is a not-for-profit entity; whether you donate your time or financial resources, 100% of your generosity goes directly to supporting the education of all ISP students. Financially, ISP’s annual budget is supported not only by tuition, but by income from facility rental, interest from the school’s endowment, and donations from community members. Your Support . 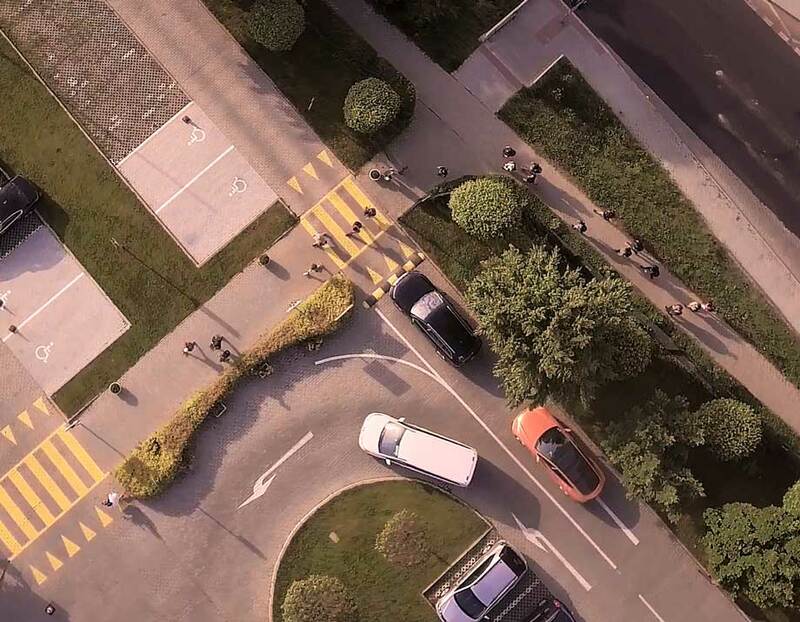 . .
…allows ISP to maintain its reputation of unsurpassed education in the Czech Republic (and beyond) – and to continue to be the type of School that attracted you to it in the first place. An ISP education today includes a student body of almost 900 students from over 60 countries, over 115 Faculty members, another 90 Staff members, all situated in a custom built campus on 6.6 hectares (16.3 acres). That’s a Student to Faculty & Staff ratio of about 4:1. Maintaining these attributes is not inexpensive, so it is only through the benevolence of our donors that ISP can continue to offer its unique form of education while keeping tuition costs reasonable and providing Scholarships. Donations may support particular programs (such as robotics and mountain biking), financial aid and scholarships, and the overall level of education without increasing the cost of tuition (which could put an ISP education out of the reach of many of our families). Understanding the impact that ISP students have in the world shows philanthropists that their gifts are put to excellent use at the School. Giving to ISP has become a tradition for all our family members – without your participation, ISP could not continue to be the same School that attracted you to it in the first place. We hope that you will respond with understanding, enthusiasm, and generosity when asked to support ISP. Volunteering doesn’t just make a difference at ISP, it makes all the difference. From the Board of Trustees, to the School Community Association, to the Alumni Council and the Annual Fund Committee, volunteers make up the foundation of ISP. ISP is governed by an all-volunteer Board of Trustees; these key volunteers are responsible for the overall direction of the School, and for hiring the Director. They receive no financial benefit whatsoever for their commitment. No less important are those who serve on the Board of the School Community Association, the Alumni Council, the Annual Fund Committee, or any other of the important groups that make ISP what it is – their efforts create lifelong memories for all of our constituents. Would you like to volunteer in some capacity? Please don’t hold back – take a first step by contacting the Advancement office (advancement@isp.cz) to learn more about the different ways you can volunteer at ISP. 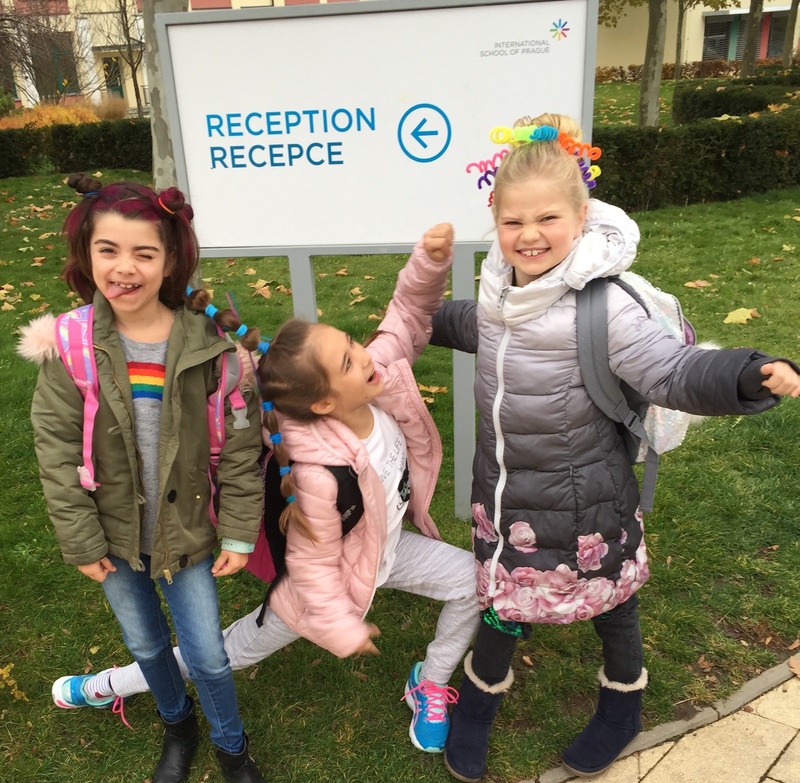 It is thanks to the financial gifts of donors that financially deserving students from the Czech Republic are able to attend the International School of Prague (a non-profit entity). 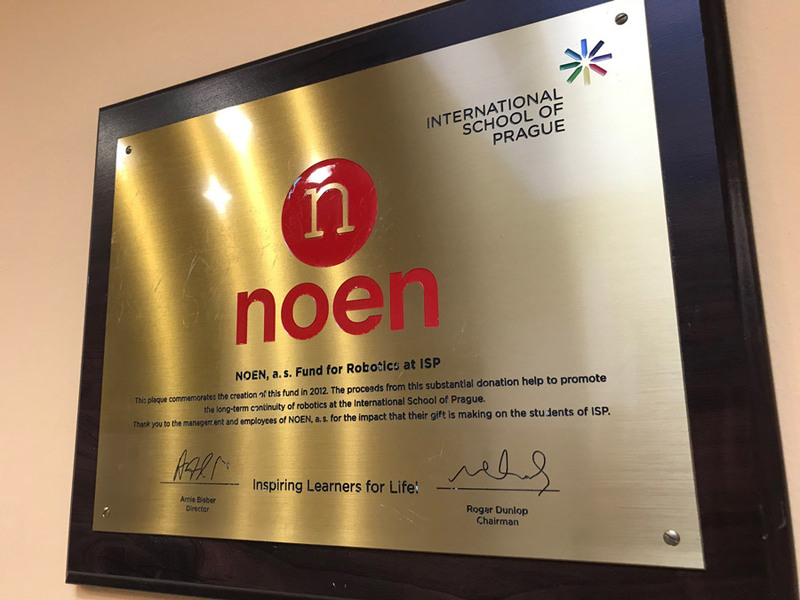 Through various giving levels, the most prestigious companies in the Czech Republic become our “Partners in Education”; the school is proud to recognize and communicate the commitment of those donors to the ISP community throughout the year. You can see below just some of the ways in which corporate donors are recognized throughout the year at ISP. 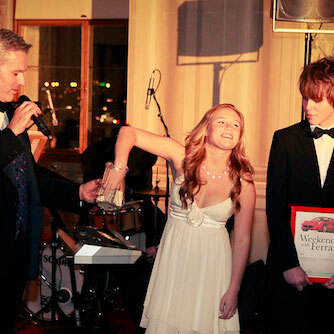 In addition to year-round recognition, the School hosts a gala evening each year, an event which celebrates our Partners in Education. This high-profile event is attended by members of the ISP parent community. With almost 900 students and 500 families from 60 different nationalities, the ISP community includes successful entrepreneurs, diplomats, journalists, and multi-national corporate decision makers. For more information, please contact the ISP Advancement Office. 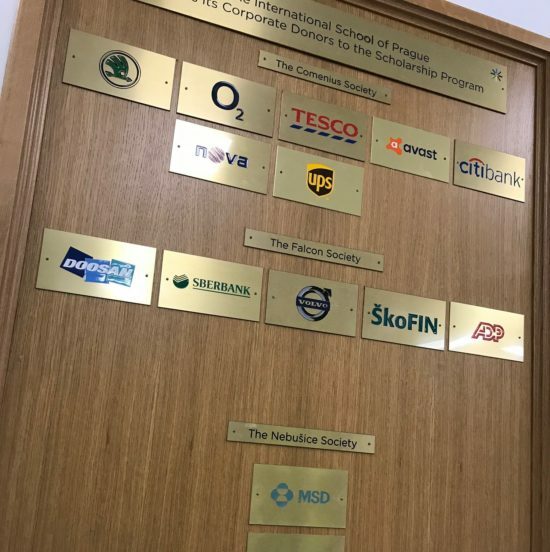 A brass plaque with your corporate logo is displayed on an oak board at the entrance to ISP, seen by hundreds of families and visitors every day during the school year. ISP is proud to provide its corporate donors with a commemorative plaque (measuring approx 20cm x 33 cm). Full color mention in ISP’s most popular publications, such as the Annual Report, the School’s most important publications for existing and potential families. ISP hosts numerous tournaments every year. 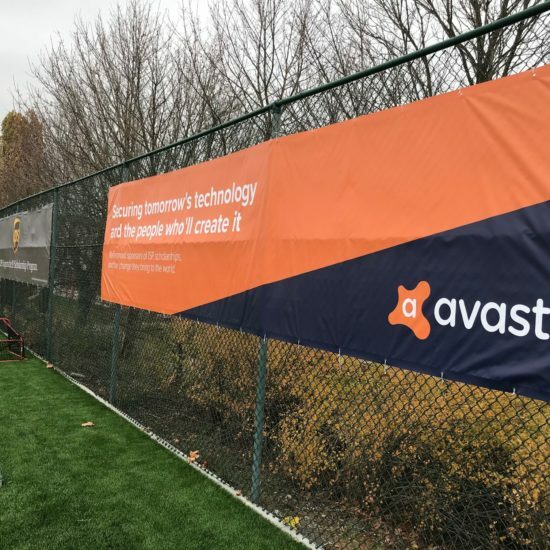 As a part of CEESA, it’s not just ISP families who attend these matches – it’s families from international schools in Warsaw, Berlin, Moscow, Istanbul, and elsewhere. 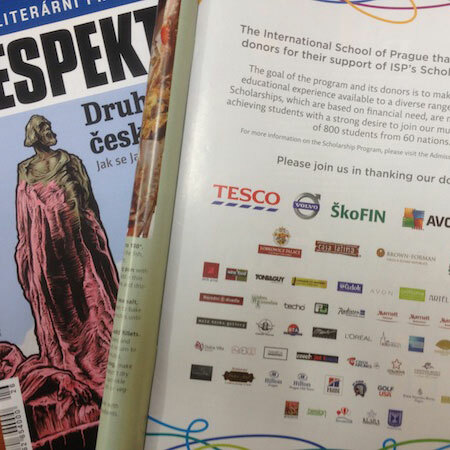 ISP is proud to announce the participation of its many corporate sponsors in respected local media such as Respekt. Corporate donors are recognized at the event in numerous ways: through all forms of communication with ISP parents and other attendees, at the event itself through roll-ups, the commemorative programme, etc. ISP’s annual budget is supported by tuition, facility rental, interest from the school’s endowment, and donations from community members. Your donation to the Annual Fund has a direct impact on our students every day. It touches every part of the school’s budget including all academic and after school programs, Professional Development (Distinguished Speakers Series), Digital Learning & Technology, Fine Arts, Sports, and Financial Aid. It provides the school with the flexibility to respond quickly to Areas of Greatest Opportunity and to meet unexpected challenges. Most importantly, it is the reason behind ISP’s global reputation for excellence in education amongst international schools. When you make your pledge, you have the option of directing your donation to several broad categories: Fine Arts, Digital Learning & Technology, Sports, Financial Aid, Professional Development (Speaker Series), or simply Areas of Greatest Opportunity. Please understand that the budget for all categories for this year has already been set based on expected revenue, so while your donation to a particular category does not increase its budget this year, it does inform our budgeting process for following years. All donations, in any currency, will receive the appropriate tax paperwork in response. Please make your CZK transfer to 1387361963/2700 (our public collection bank account, registered under public collection number S-MHMP/515652/2018). In the message area, please write, “AF” and (if you’d like) “Arts”, “Technology”, “Sports”, “Financial Aid”, “Pro. Dev.”, or “AGO” (Areas of Greatest Opportunity). In the note area on the check, please write, “AF” and (if you’d like) “Arts”, “Technology”, “Sports”, Financial Aid”, “Pro. Dev.”, or “AGO” (Areas of Greatest Opportunity). Fundraising for the Annual Fund takes place every year. Donations to the Annual Fund confirm the community’s desire to go beyond the cost of tuition to purchase items and programs that will have an immediate impact on current students. It elevates ISP to the level of excellence that tuition alone cannot provide. How are donations to the Annual Fund used? Why not just raise the cost of tuition? Despite ISP’s reputation for outstanding facilities and educational excellence, the cost to attend ISP is competitive with other independent schools in the region. This is partly because we are a not-for-profit (all proceeds go towards improving the experience of ISP students), but also because donors add to our programs, which allow us to offer more without charging more. Raising tuition to cover increased needs is a possibility, but it is a short-term solution; eventually, we would price ourselves so far above other schools that we would be considered not competitive. Worse, raising tuition might also make an ISP education unaffordable for many of our families, all of whom make ISP the type of community that is so attractive. Donations can be made to either of two entities, both of which support ISP students, and both of which provide tax deductions. Individual tax circumstances vary, so please consult your tax advisor. International School of Prague, s.r.o. (a Czech corporation – tax deductible for Czech tax payers, to the extent permissible by Czech law). My company matches gifts – can ISP accept corporate matching gifts? Absolutely! 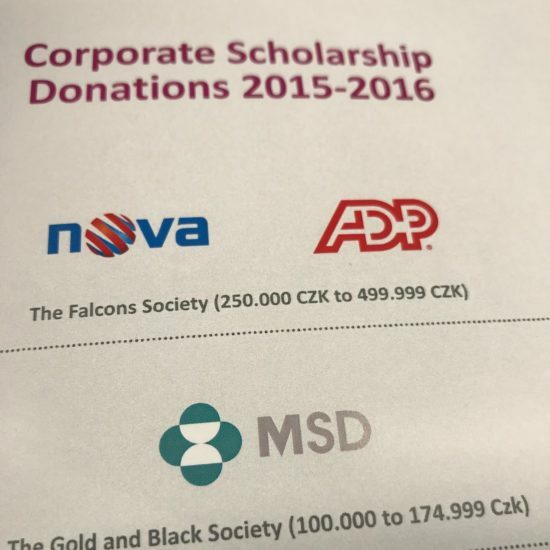 Many U.S. companies match employee donations, and The International School of Prague Foundation is qualified to accept them. Corporate matching gifts are a great way to easily increase the effect that your donation can have on ISP students, so please contact the ISP Advancement Office if you would like help in determining whether your company will match your donation. Please make a donation that is meaningful to you. What that amount is depends on the individual, but all gifts add up to the whole group’s ability to continue the level of excellence at ISP. Please be a full, participating member of our community – support the Annual Fund at a level that is appropriate for you. When is the best time to donate to the Annual Fund? Our academic (and fiscal year) runs from July 1 – June 30. We send our first request for participation in September, and we continue to ask (politely!) in various ways throughout the year. Donating early allows us to thank you profusely and stop sending reminders. We already give to many charities – why is ISP so deserving? Many ISP parents are generous philanthropists, supporting deserving charities around the globe. Understanding the impact that ISP students have in the world leads many to know that their donations to ISP have long-term effects beyond the halls of our school. Donations to the ISP Annual Fund benefit current and future students. We hope that this will allow you to consider ISP worthy of your highest philanthropic goals. An Endowed Fund is an investment in the future of ISP. Endowed Funds are established by a donor to support a general or specific program at the School; for example, a donor who wishes to support the sciences at ISP may establish a fund to support the salary of a science teacher. Or, a donor might wish to see a specific sport being taught, in which case he/she might establish a fund to support the purchase of equipment necessary for that sport. The goal with an Endowed Fund is to provide the support in perpetuity. Generally, therefore, a substantial gift is made (either in a lump sum or over the course of several years), and that amount is invested with the School’s Endowment. Generally (but based on the wishes of the donor), only the income from that invested gift is used. If you would like to discuss your idea for an Endowed Fund, please contact the Advancement Office – we would be honored to talk about any of your ideas for supporting ISP.